Every once in a while there comes along a photo which will just stick in my head. Some of them I didn't even actually take - there's a fantastic shot I have from New Zealand 15 years ago which I didn't actually take - but in the case I did. 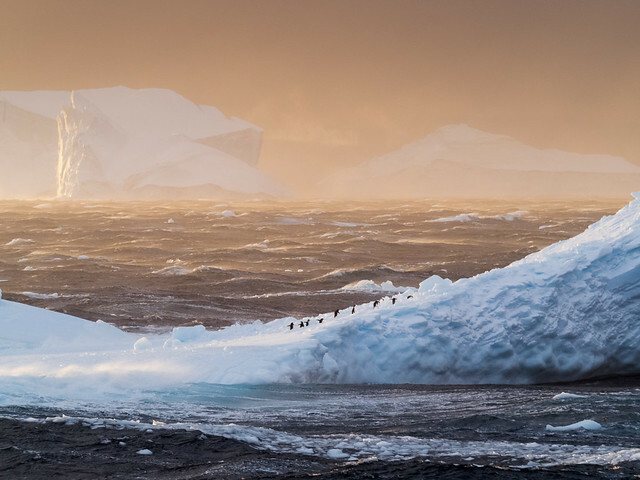 The location is the Antarctic Sound, 2 weeks ago. There was an absolutely insane storm blowing, with unearthly lighting that I'll never manage to convince anybody isn't Photoshopped. The ship was being blown through an expanse of tabular icebergs, providing non-stop shots of a lifetime, provided you could find somewhere to wedge yourself in to avoid getting flattened by the wind or thrown over the side by the motion. Most people had, sensibly, retired to somewhere sheltered with things to hang on to, and sturdy paper bags nearby. We hung on. And then this happened - an iceberg, loaded with frantic Adelie penguins careened crazily past. There cannot have been more than 30 seconds to grab a shot, but for once I kept my wits about me and got four. Here's one of them. Ok, yeah, it isn't absolutely pin sharp at 100%, but I'll take it.